Not going to lie: I love cake. One of the biggest challenges of consistent healthy eating is to resist the temptation of sugary treats. Of course I eat them – occasionally. But cutting down on sugar has done so much good for my health – happier stomach, clearer skin, no more insane blood sugar fluctuations – and I’d like to keep it that way. I can’t go long without sweet treats though, so to prevent the inevitable sugar binge I have integrated a load of healthy sweet alternatives into my daily diet. One of them is this brilliant cake alternative, which is not just utterly delicious but also incredibly versatile. I always have a batch in the fridge and rely on them for my daily afternoon snack – you know, that 3pm low in the office when everyone gets their Snickers out and you’re just dying for a quick energy boost. 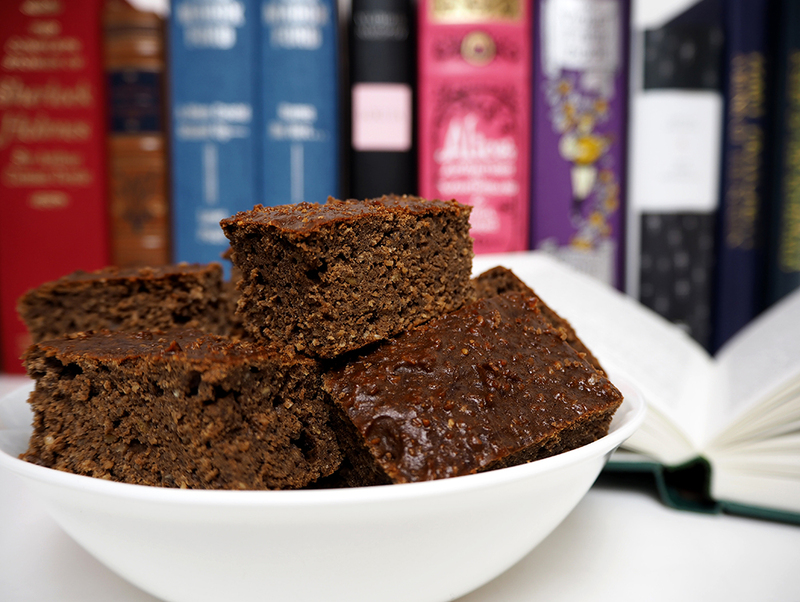 These brownies are based on chickpeas, dates, nut butter and oats, making them vegan, gluten-free and refined sugar free. My version is medium sweet, so if you have a very sweet tooth just up the amount of agave nectar a bit. You can also add chopped nuts, a mashed banana, a couple of shots of espresso or chocolate chunks to jazz things up a bit. The recipe is very flexible and has already evolved into an exciting range of other cakes. My favourite variations so far are apple and cinnamon cake, spiced carrot cake and a total showstopper of a vanilla protein blondie. My friend took the basic recipe and turned it into a spiced pumpkin cake, and is also experimenting with a savoury version. This cake offers a lot of room for experiments. So give it a try and get creative, throw in your own ideas and let me know in the comments if you come up with new variations! Preheat the oven to 175°C. Brush a 24cm square (or equivalent size) brownie tin with coconut oil. Put the oats in a food processor and blitz until they are finely ground. Add all the other ingredients and process everything into a smooth mixture. Fill the mixture in to the brownie tin, spread evenly, and bake at 175°C for around 30 minutes, or until a toothpick stuck in the middle of the cake comes out clean. It’s ok if you still get a slight wobble in the middle; that will ensure you get a brownie-like consistency. Leave to cool in the tin, then cut into squares or slices. * To ensure the brownies are gluten-free us GF-certified oats and baking powder. 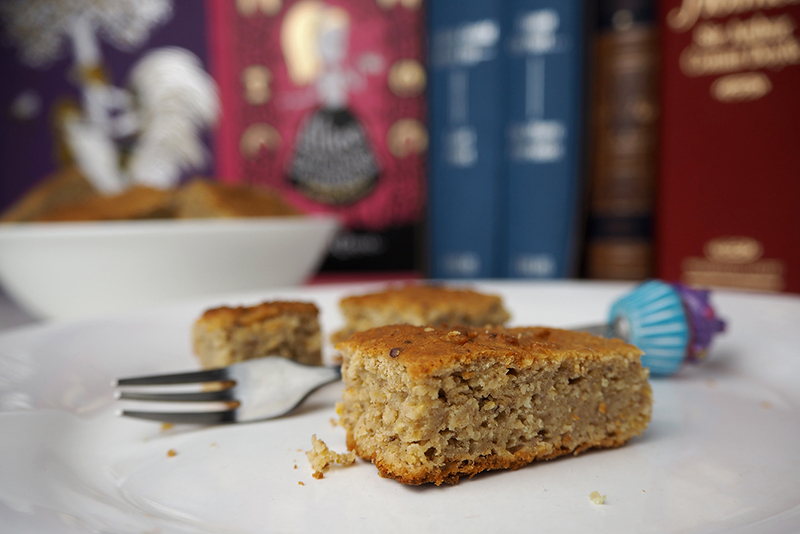 Of all the chickpea-based alternative cakes, these indulgent but guilt-free vanilla blondies are definitely the most popular variation so far. They are as sweet and delicious as real cake, but low in fat, gluten-free and high in protein as the rely on chickpeas instead of the usual flour-eggs-butter basis. The more I experiment with chickpeas, the more amazed I am at the versatility this little pulse offers for baking sweet treats. 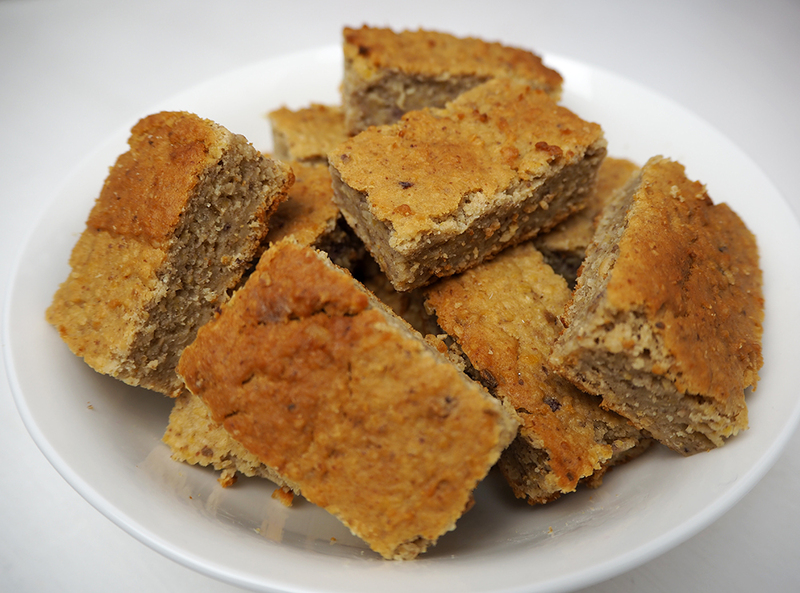 For the past half year or so, I’ve had a batch of chickpea-based cake slices – flavoured with different ingredients, from cocoa to apple and lemons to almond – in my fridge in any given week. They’re my go-to energy-boosting snack for long afternoons in the office, and a healthy treat for whenever I fancy something sweet. This blondie version happened when I threw some of my favourite vanilla protein (Diet Whey from PhD) into my basic brownie recipe to see what happens. What happened was simply awesome cake! 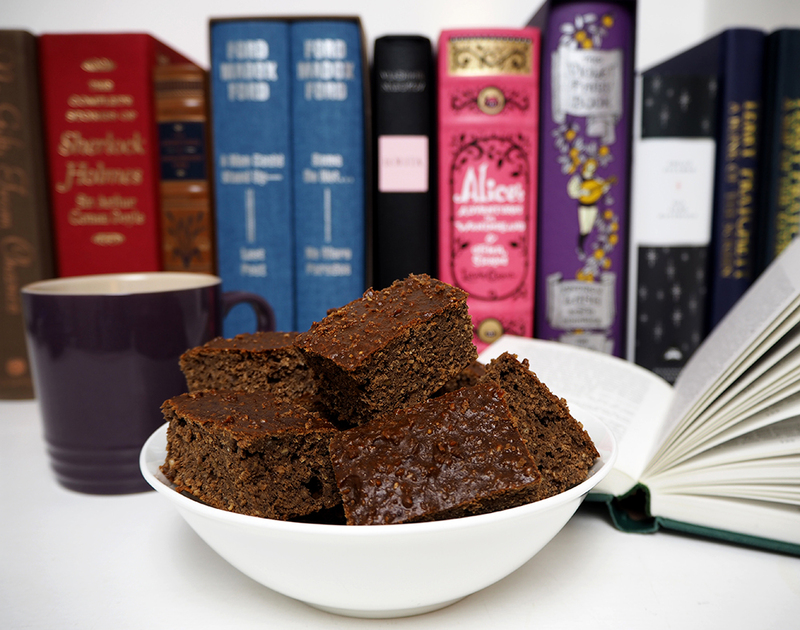 Fill the mixture in to the brownie tin, spread evenly, and bake at 175°C for around 30 minutes, or until a toothpick stuck in the middle of the cake comes out clean. It’s ok if you still get a slight wobble in the middle; these are nicer slightly undercooked so they don’t go too dry. These blondies keep in the fridge for around a week. * To ensure the cake is gluten-free us GF-certified oats and baking powder. I love tarka dal but if you’re doing it properly it just takes forever to cook. I usually make a huge bowl when I’m cooking curry anyway and freeze it in small portions for an occasional treat. Here’s a quick and tasty red lentil dip that reminds me of the flavours of a nice, comforting bowl of dal but is a lot quicker to make. 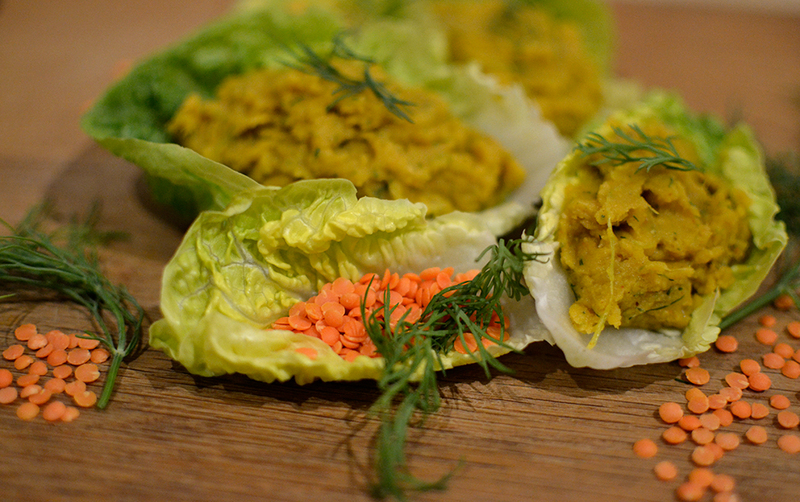 It’s also a bit lighter and tastes great with veggie sticks or spread on crunchy lettuce hearts. A perfect addition to the lunchbox! This is a recipe for Thermomix, but you could also make it with a blender or food processor – see alternative instructions below. Chop the celery and chili for 5 seconds / speed 5. Add the lentils, water, stock and spices. Simmer for 25 minutes / 100&degC / speed 2 – keep an eye on it as the lentils can rise up a bit when the water starts boiling. 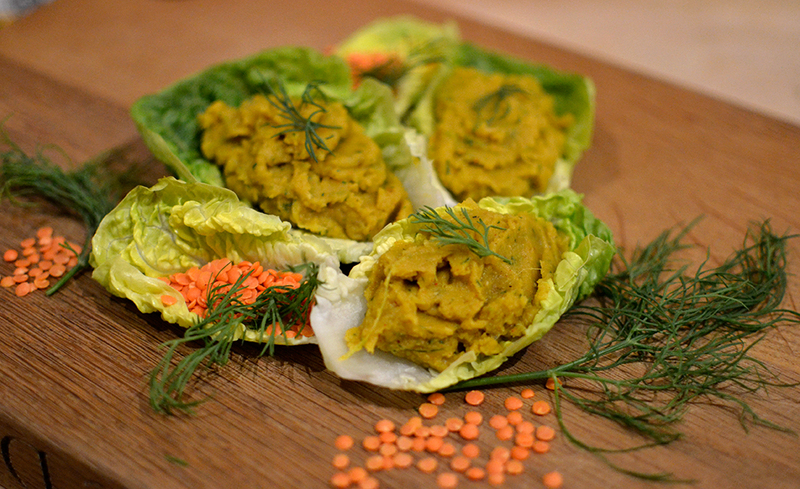 Add the spring onions and dill and puree gradually on 2-4-6-8 until you have a smooth paste. Chop the celery roughly, chop the chili finely and fry both in a little olive oil until soft. Add the lentils, water, stock and spices, bring to the boil and simmer for 25. Put everything into a food processor, add the spring onions and dill and blitz until smooth.